The morning of the tryouts for the swim pre-team was a rare, cold, rainy June morning. I was 6 and would need to just swim one lap of a 25 yard (not meter, yard) pool in order to earn my spot on the team. I stood at the side of the pool shivering as my goosebumps grew goosebumps from both the cold and my own nerves. By the time it was my turn, I could barely breathe. I jumped in and began to swim as my peers and my mother looked on. As cold as the air was, the water was colder and my red and white speedo swim suit did nothing to insulate me. My teeth were chattering and as I turned my head to take a breath I took in a mouthful of water and started to cough. Gasping for air, I grabbed for the ladder about 3/4 of the way down the length of the pool and ended my swimming career. I wasn’t ever meant to be a swimmer and decided later to have a go at diving. Not surprisingly, this also turned out to be a challenge for my lanky 10-year old body. The most common thing I heard following any one of my very low degree of difficulty dives at a meet was ‘Fail Dive’. When I finally quit the diving team two-years later, my coach smiled and thanked me. These failures at water sports were painful – but, I really wasn’t all that disappointed. Gymnastics – that was my passion, my everything. Every four years when the summer Olympics start I am reminded of my experience with competitive gymnastics. I was 11 and had convinced my parents to send me to Murial Grossfeld’s Academy for Gymnastics summer camp in upstate NY. Before Bela Karolyi there was Murial Grossfeld. Murial was known as ‘The Tyrant of Girl’s Gymnastics’ and once told a 12-year old: ‘Don’t be a lady on that beam! Be an animal!’. She was a big deal in the sport for Americans. After a week of intensive 8-hour days training on all the apparatus, each student was granted a ‘hearing’ with Murial. My meeting with Murial was the most important moment of my life. I entered the room and was completely in awe of her. Even though I had been at Murial’s camp all week, I had yet to be in her presence. I walked in slowly and sat down as she directed. Ms Grossfeld looked at my skills evaluation report that lay on the desk in front of her and then looked up at me. Sigh. Pause. And then….’You will never be gymnast. Find something else.’ And that was it. My gymnastics dreams shattered in two terse sentences. In spite of my shattered dreams of Olympic gold, my passion for the sport did not diminish. I love gymnastics and will spend the next 14 days glued to the television watching the US Women and Men perform. Tonight is the Olympics opening ceremony. I am gathering with friends to watch and have been charged with bringing dessert. 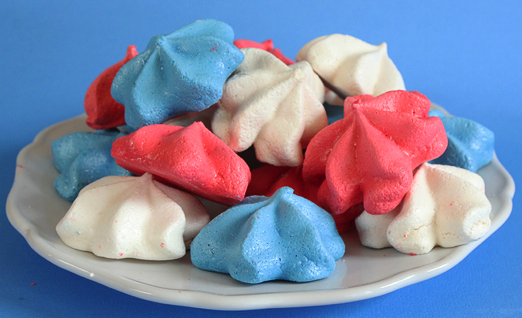 In an effort to make something patriotic, I am preparing Red, White and Blue Chocolate Chip Meringue cookies. The recipe below is a tweak on Claire Robinson’s from the Food Network. These are so easy – just a little time consuming. In a large bowl, using a hand beater, or, better yet, a KitchenAid Mixer with the whipping attachement, beat 4 egg whites, 1/4 tsp cream of tarter, a pinch of salt and 1/4 tsp vanilla until soft peaks form. Divide the egg white mixture into thirds. In the first third, gradually add 1/4 cup of sugar and beat until the sugar dissolves and stiff peaks form – about 3 minutes. Remove the white meringue mixture from the bowl. In the second third, gradually add 5-7 drops of red food coloring and 1/4 cup of sugar. Beat until the sugar dissolves and stiff peaks form, about 3 minutes. Repeat this process with the final third using 5-7 drops of blue food coloring and 1/4 cup of sugar. Into each color, gently fold 1/3 cup of chocolate chips. Drop the batter onto silicone mats or parchment lined baking sheets (will need 2) with a teaspoon, spacing at least 2 inches apart. If you’re not putting in chocolate chips, you can use a pastry bag to make prettier meringue cookies. Bake until the meringues are dried through, about 2 to 2 1/2 hours. The cookies will remove easily from the parchment or silicone mat when ready. And their red, white and blue color will be the perfect dessert for any Olympics themed event. I have long since accepted that I will “never be gymnast” and I did eventually ‘find something else’. The kitchen is my stadium and the stove top, my torch. And instead of being adorned in gold medals, I’m surrounded by copper pots.